A plague of demons getting you down? Has a loved one started gibbering in the inscrutable language of Hell? Not to worry-there are people trained to cast out those spirits! 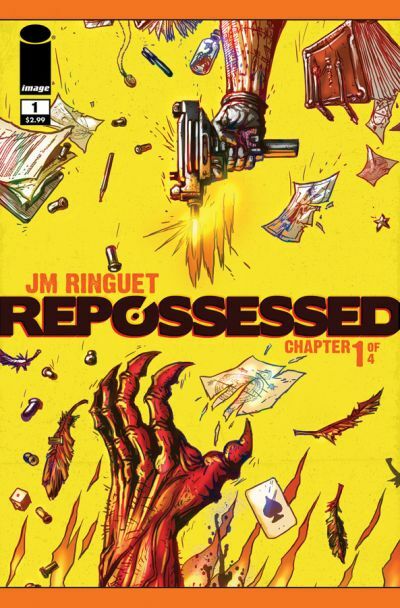 In January 2013, Image Comics will introduce you to the Dee Agency and three of its tough-as-demon-claws agents in REPOSSESSED, a raucous new mini-series by JM Ringuet (TRANSHUMAN). No-nonsense Joe, swaggering Clay, and whip-smart Martha are the best repo team at Dee Agency. Their demon-vanquishing gear consists of big guns, bigger grimoires, and a good supply of silver bullets and saints’ teeth-and they know how to use them! (Though Clay does tend to be heavy on the bombastic combat talk). They’ll need all of their skills to complete a seemingly easy mission to repossess a rich girl who has run away to Las Vegas-because this is one case of something that happens in Vegas no t staying in Vegas. REPOSSESSED is a supernatural action-fest, with the wryness of Hellboy and the badass attitude of classic Grindhouse films-exactly what Ringuet wanted to create. The first issue of this Dodge Charger (with a sweet flame paint job) of a comic is due in stores on January 9. Pre-order it at your local comics store from the November issue of Previews now, and save yourself the race down the interstate to snag the last issue on the shelves!